Here's what I like about Deathmarks (since I obviously need some Crypteks in the list, and I should round out the Immortals to give me 2 potential scoring units). Deathmarks, and attached Harbingers, both benefit from the 'Hunters from Hyperspace' special rule (aka wound any marked unit on a 2+). This makes for a devastating combo when Harbingers of Despair are attached to the unit, granting them 2+ to wound with their AP1 template weapon. Here's the catch: a Deathmark squad can only mark a unit when they are deployed and only a "non-vehicle enemy unit on the battlefield" can be marked. So if you deploy first, there is nothing on the field to mark. This is why the 'Ethereal Interception' rule is also included; so even if you win the roll off to go first, these guys can be kept in reserves and still come down later after the enemy has most of their units "on the battlefield". But the Harbinger must also be able to deepstrike, per the latest Necron FAQ. Luckily, if you include the Veil of Darkness wargear, the squad may choose to deepstrike instead of walking on the board, allowing them to mark the unit on the way down. My question is, is that worth 155pts? Initially I think it is, mostly because of the list I'm planning on running. But on the other hand, I don't think running an extra unit of Tesla Immortals would be a bad move either -- it's always nice to have extra scoring units, especially when they come with S5 assault weapons. What's your take on the Deathmarks? Does the deepstriking Harbinger w/ awesome AP1 template make them worth it or should I spend those points elsewhere, like on more troops? The Harbinger is a nice trick, though I'm not really sure if it's particularly needed- it does add some nice point defense if you're worried about a unit that will get close quickly, though. Remember you can also purchase the Nightmare Shroud, which can help force units back as well. If you're running Deathmarks, you need to make sure the rest of the list can handle breaking open enemy tanks sufficiently well, which probably means some Scarabs, lots of Harbingers of Destruction, etc. I don't believe that the Harbinger of Despair can Deep Strike naturally- the Veil lets him DS _instead of moving_, which isn't the same thing. On the other hand, that isn't a real problem, since the ability to arrive by teleporting in the enemy turn is really just a gimmick for the most part anyways. I completely agree, the more units of Deathmarks you can run the more value you'll get out of them. I think this pretty much makes the decision for me... while I do like the potential they can bring, I just don't see myself purchasing and fielding enough of them to really take advantage of their rules. Maybe I'll re-evaluate after 6th drops, if they gain any benefits at that point, but for now I'm sticking with my original plan of using most of the units I already have and keeping the investment in new models at a minimum. I haven't posted what that list will look like yet, but the initial draft looks like it'll be fun -- definitely not optimized, spammy, or overly competitive, but fun nonetheless. Hardly any mech, but lots of variety while sorta maintaining duality and overlapping roles, at least on paper. In the end, it looks like I'll be building a court with one box, and magnetizing Immortals for the other (Tesla sounds awesome and I like the mechanic, but I'm a big fan of Gauss still, so I'm building them to accommodate both options). And that's my bad for the confusion; I didn't articulate the Veil of Darkness Harbinger + Deathmarks deep strike very well at all. The post made it sound like I was saying that the Harbinger can also benefit from the Deathmark's 'Ethereal Interception' rule -- I don't believe this is the case. What I meant to reference was the Necron FAQ regarding a unit placed in normal reserves that contains a Veil, which states that the unit arriving from regular (aka walking on ) reserves can elect to use the Veil to deep strike instead of walking on from your table edge, as this is done in place of the standard movement during your turn (so no Interception and coming on during the opponents' turn, which doesn't seem very appealing anyway). But thanks for taking the time to comment and share your thoughts! 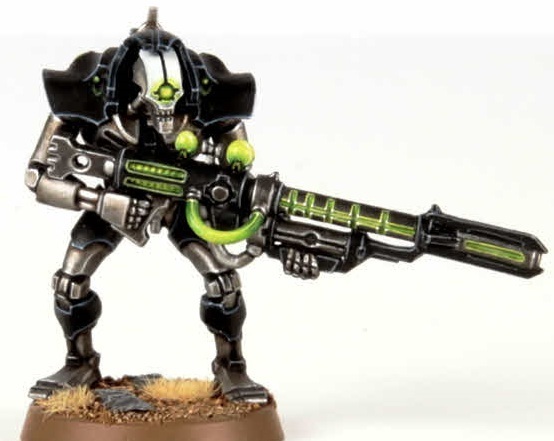 I really enjoyed your Necron codex review over on 3++! Good stuff as always!